It is not often easy to find top-notch medical care in rural communities, but for Stratton and the surrounding towns, Stratton Mountain Urgent Care at the Carlos Otis Clinic is a priceless resource that’s available to everyone. 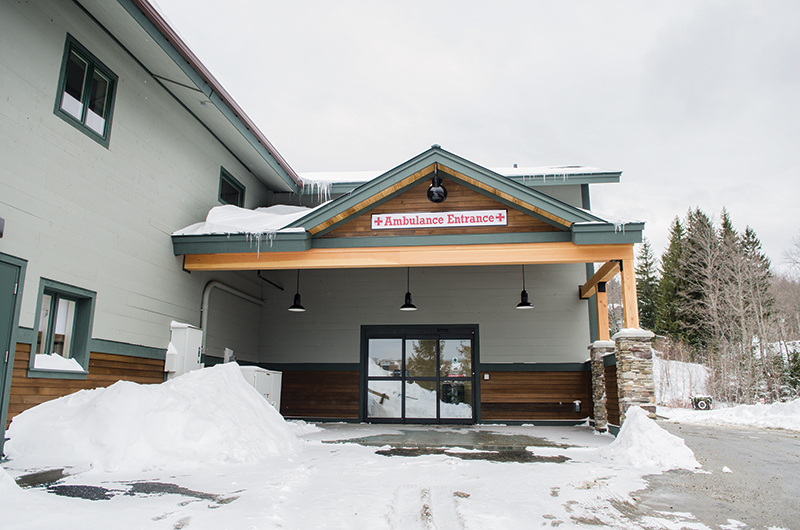 The state-of-the-art medical facility behind the gondola base is open throughout the ski season with a staff that includes veteran emergency room physicians and orthopedic surgeons from hospitals in Boston, New York, and beyond. Longtime local doc Carlos Otis started the clinic back in 1971 to provide both general and urgent care to the Stratton community during the winter months. Since then, the facility has treated thousands of local residents and resort guests for a myriad of illnesses and injuries, earning praise from scores of grateful patients. Most of the volunteer doctors are clinic regulars who typically sign up for weekly rotations at the resort year after year. “It’s become a family tradition for a lot of our doctors,” Boyd said. Dr. Elizabeth Matzkin and her husband, Dr. Eric Smith, are both orthopedic surgeons in Boston. She is an associate professor at Harvard Medical School and surgical director at Brigham and Women’s Hospital where she specializes in women’s sports injuries. He is an associate professor at Boston University School of Medicine and a reconstructive orthopedic surgeon at Boston Medical Center specializing in various types of hip surgery. They volunteer at the clinic for two weeks every year when their three daughters have Christmas and February school vacations. 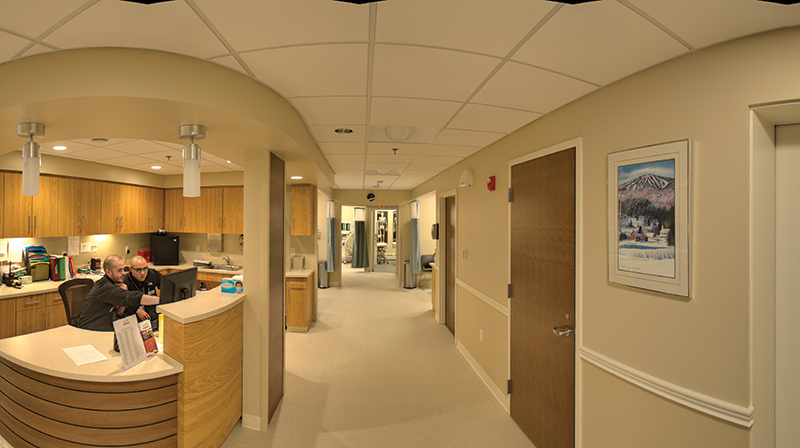 Here, patients can walk in and see an orthopedic surgeon right away, which in a city could take weeks. And for patients suffering from coughs, colds, aches, pains, or any other ailment where they need to seek treatment, the clinic staff is ready to help. 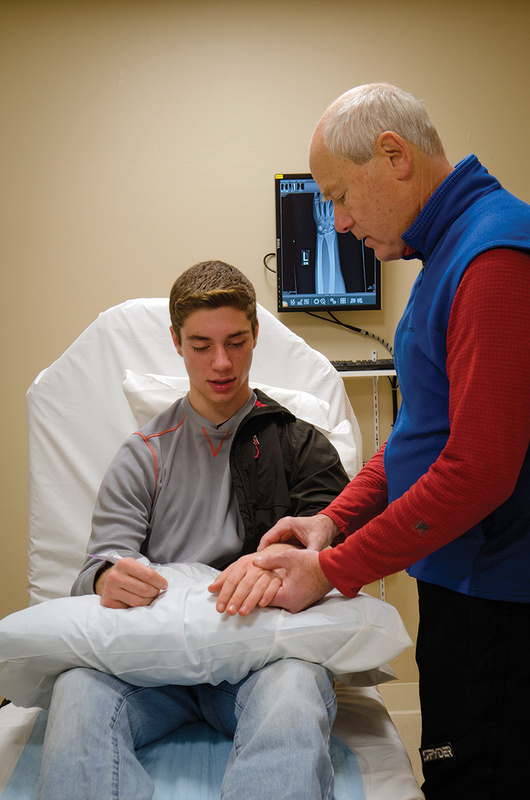 That kind of support from the Stratton community has made it possible for the facility to grow from a small orthopedic clinic at the base of the mountain to the full-service medical center of today. “The only way a clinic like this could exist is by community involvement,” Kittredge said. “The Stratton community has faith in the clinic; they want to have a facility like this available, and without that kind of support we wouldn’t exist. From its humble beginnings back in 1971, Stratton Urgent Care at Carlos Otis Clinic has evolved into a critical local resource, providing top medical care to skiers and snowboarders as well as Stratton guests, employees, residents, and the community at large. “I think if Doctor Otis were alive today, he’d be so happy to see what the clinic is capable of doing on any given weekend,” ski patroller Anderson said. “He’d be very proud. 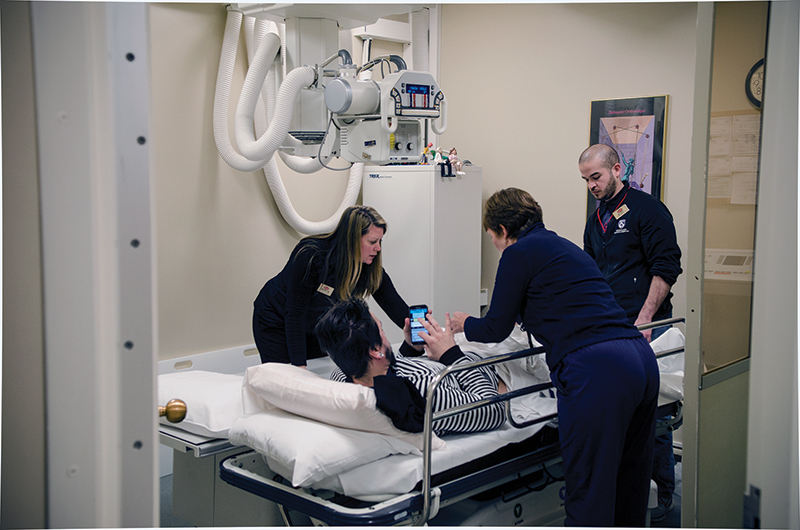 The staff at the Carlos Otis Clinic can successfully treat approximately 95 percent of those who come through the door, but occasionally someone has to be transported to a hospital and that’s where Stratton Mountain Rescue comes in. The rescue squad is a team of emergency medical technicians, and paramedics, most of whom also work as members of the Stratton Mountain Ski and Safety Patrol. 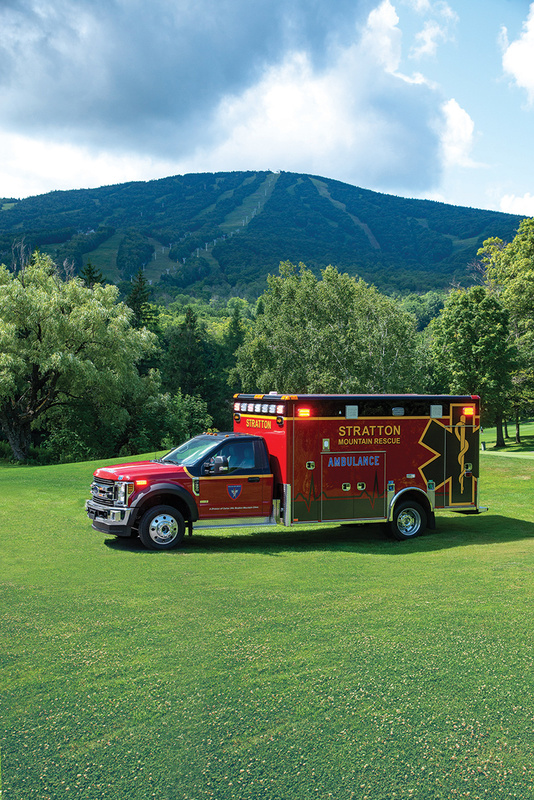 Stratton Mountain Rescue is also charged with maintaining and manning the clinic’s new state-of-the-art ambulance, and monitoring and caring for patients from the time they leave Stratton until they are safely in the hands of the hospital. The team also responds to calls anywhere in the resort community or the surrounding area as part of the local mutual aid system, covering emergencies for eight nearby towns when those EMTs are busy at another scene. Recently Stratton Mountain Rescue also began a backcountry rescue program comprised of roughly a dozen patrollers who are trained to go out into the woods armed with survival gear, mapping programs, rescue packs, and other equipment to locate anyone who wanders off the trails and gets lost or injured in the woods. “Most of the rescues are pretty straightforward; we follow the tracks in and find them,” said Ski Patrol Director Chris Schilling, who runs the backcountry program with Truskoski. Finding lost adventurers, caring for the injured, and providing assistance to the community at large is all in a day’s work for the first responders of Stratton Mountain Rescue, the unsung heroes of Stratton Mountain. 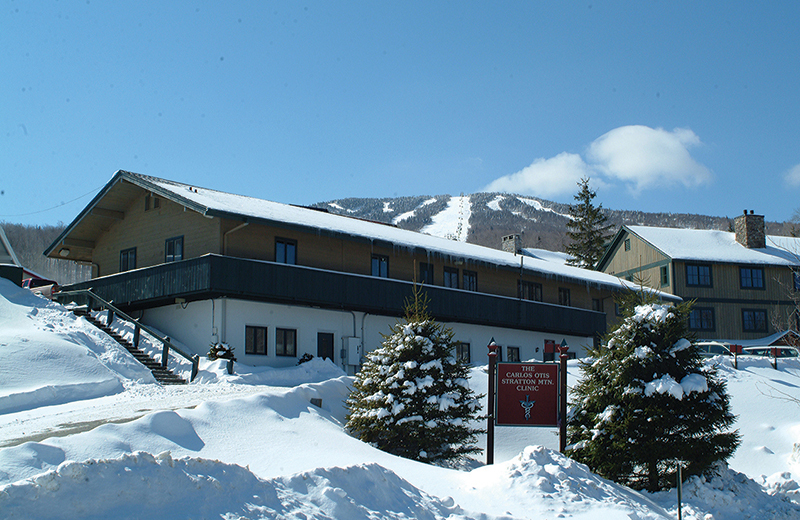 The Carlos Otis Clinic is a not-for-profit medical facility that operates Stratton Mountain Urgent Care and Stratton Mountain Rescue.